FOR the first time in Talisay City, the celebration of Al Cinco de Noviembre highlighted the country’s historic legacy in song and dance with the public performance of the Philippine National Folk Dance group, the Bayanihan Dance Company, in the Talisay plaza on November 5. With the partnership of Third District Representative Alfredo Benitez and the City of Talisay through Mayor Neil Lizares, and the cooperation of Jose Francisco Benitez, chairman of the Bayanihan Dance Company and president of the Philippine Women’s University, the Bayanihan brought its Teaching and Touching Lives program led by Suzie Benitez, Trustee and Executive Director of the Bayanihan, together with 14 top Bayanihan dancers and musicians of the Bayanihan Rondalla. The Al Cinco de Noviembre program also featured performers from Colegio de San Agustin and the Kagayon Dance Troupe, champion of the contemporary dance competition of the National Commission for Culture and the Arts. Lizares and PWU President Benitez also led the city officials, multi-sectoral leaders and the Knights of Columbus in the commemorative and wreath-laying ceremonies for the Talisay heroes of the Negros Day at the monument of General Aniceto Lacson at the Ayala North Point. Heirs of the Talisay 1898 revolutionary movement leaders, General Aniceto Lacson, General Simon Lizares and Don Julio Diaz were presented with tokens of appreciation by the Talisay City government. 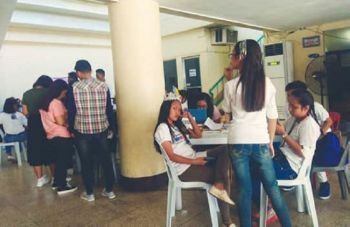 Meanwhile, on November 4, a total of 143 students, teachers, choreographers from schools and barangays in Talisay City experienced the discipline and creativity, the energy and artistry of the Bayanihan as they conducted a dance workshop held at the Carlos Hilado Memorial State College in Talisay City. The three-hour workshop also attracted participants from Bacolod, Victorias, Cadiz and Kabankalan Cities.